I have always loved Bart and Daphne’s Araujo wines (now called “Eisele” after the vineyard). To me, in blind and non-blind tastings, they stood out for their fantastic aromatics (much like Screaming Eagle does for me as well, these are wines you can just sniff and fall in love with). The Araujo’s second act brings together the same elements they had at Araujo -- winemakers Francoise Peschon and Nigel Kinsman (brilliant winemakers both), Bordeaux-based consultant Michel Rolland, with the difference being that grapes are sourced from a variety of vineyards. They chose their favorite sites like Vine Hill Ranch, Sleeping Lady and Oakville Ranch, and have two more vineyards that they are developing themselves which will be added to the mix in the coming years. They have also hired vine whisperer Steve Matthiason to handle all of their farming. A fine addition to the all-star cast. The wines are dazzling. Read the reviews below for another data point or two, but TRUST YOUR WINE MERCHANT! Dead-serious stuff! According to Bart (in this excellent Wine Spectator article), he was inspired by the amazing older vintages of Napa Cabernet (Mayacamas, Heitz, Phelps, etc.) and is striving for that level of complexity and ageability. A MUST for serious Cabernet drinkers and collectors! IN STOCK, ready to go! Super-limited! Bart and Daphne Araujo sold their highly acclaimed winery, Araujo on the famed Eisele vineyard in 2012, but they are far from done in the wine industry. They have always said their best wine is yet to be made. 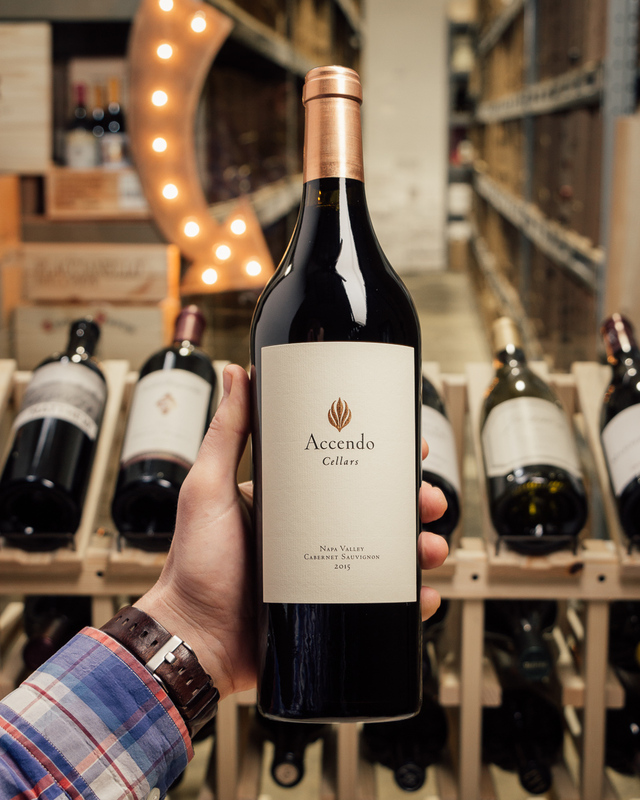 They started Accendo Cellars to make Cab and Sauv Blanc inspired by the revolutionary Napa Valley wines of the 1950s, 60s and 70s. Wines of balance and restraint. Now joined by their children the two generations are working side by side at their new Oakville property. Produced from 92% Cabernet Sauvignon, 4% Cabernet Franc and 4% Petit Verdot, the 2015 Cabernet Sauvignon offers up profound wild blueberries, freshly crushed blackberries and chocolate-covered cherries scents with suggestions of Chinese five spice, Sichuan pepper, bay leaves and lavender plus a savory touch of yeast extract. Medium to full-bodied, it fills the mouth with expressive, multilayered blue and black fruits, all supported by ripe, fine-grained tannins and a lively backbone, finishing long with a compelling earthiness coming through. The 2015 Cabernet Sauvignon is plump, juicy and wonderfully expressive. Super ripe dark cherry, plum, mocha, cinnamon, new leather and spice flesh out in a racy, radiant Cabernet Sauvignon endowed with tremendous depth and resonance. Easygoing and inviting, the 2016 will drink well upon release and for many years to follow.